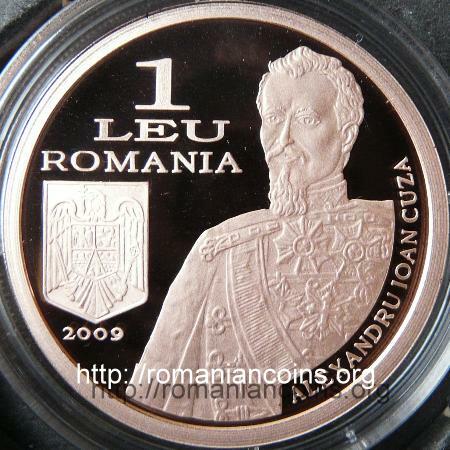 Obverse: face value 1 LEU, ROMANIA, Romanian coat of arms, year 2009, at right inscription ALEXANDRU IOAN CUZA and the bust of the prince Reverse: an image depicting the encounter of the troops of the Romanian Principalities at Socola camp near Iaşi, year 1859 (when this occurred), the mark of the General Staff from 1860 and inscription "150 ANI STATUL MAJOR GENERAL" meaning "150 YEARS GENERAL STAFF"
The double election of colonel Alexandru Ioan Cuza was followed by the process of institutional unification of the two principalities - Moldavia and Walachia. One of the early unifying measures was a swap of military units. The commander in chief of the Moldavian Army, general Constantin Milicescu, sent to Bucharest two battalions of the Musketeer Regiment (established in 1830) and the Mounted Battery, while the commander of the Walachian Army, general Barbu Vlădoianu, sent to Iaşi the 3rd Infantry Regiment. In order to prevent any tentative of foreign military intervention against the Union of the Principalities, between April and September 1859 more than 11000 troops from both armies joined at the military camp of Floreşti, near the city of Ploieşti. At the time of the Union all the armed forces of the two Principalities were about 26000 strong trops, 7000 of them from Moldavia. The General Staff Corps was established in 1859, through the General Order no. 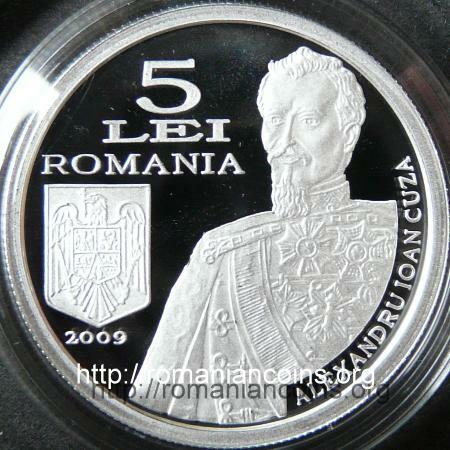 83, given by prince Alexandru Ioan Cuza on November 12th. 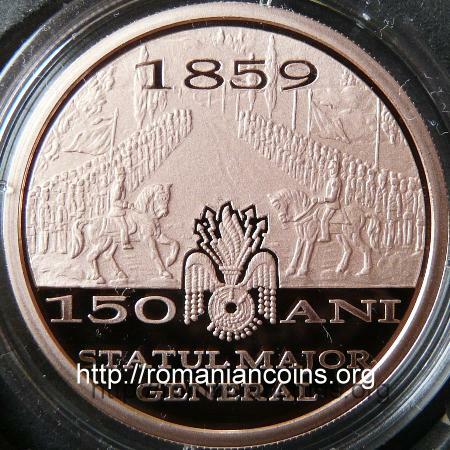 The image of the encounter of the principalities' armies represented on the coin reverse is most probably a reproduction of a gravure inspired by a drawing made by Alexandru Asachi (son of Gheorghe Asachi) entitled "Encounter of the standard of Stephen the Great with the one of Michael the Brave at Socola, at April 21st 1859". 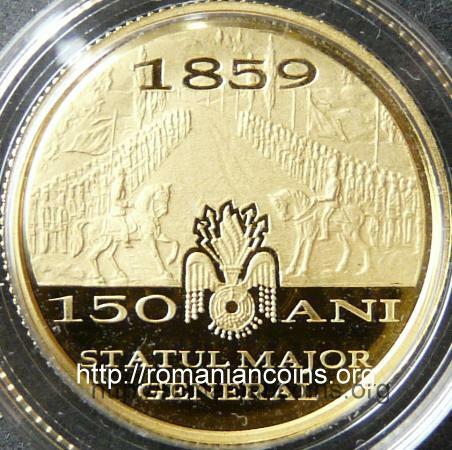 The image represents the arriving of the 3rd Walachian Infantry Regiment at Iaşi and the festive welcoming of the Walachians by the Moldavian soldiers and by the people of Iaşi - capital of Moldavia. 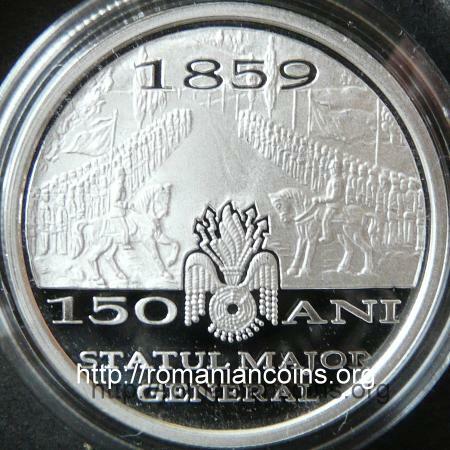 Unfortunately, the design of the coin was chosen neglecting the local context of the gravure, thus giving the final design a strong impression of conventionalism and generic representation. The gravure suggested that the scene of the encounter took place on the road towards Vaslui, in the Socola neighbourhood of Iaşi. The orientation is from South (coin top side) to North (coin bottom, towards Iaşi) - judging by the placement of the Socola Monastery on the hill on the right of the image. Socola Monastery was established by voivod Alexandru Lăpuşneanu and was the place where Ion Creangă, the great Romanian writer, learned at seminary to became priest. 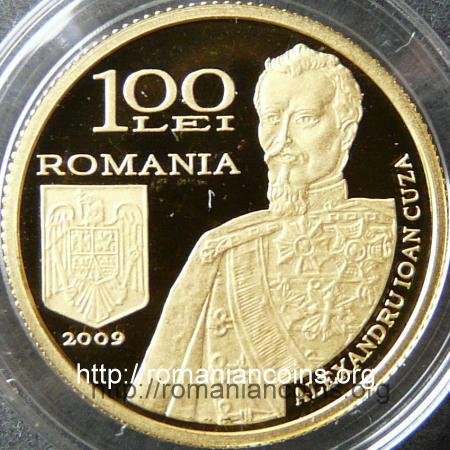 The effigy of prince Cuza appears on the 50 lei 1991 - 1996 circulation coins and on some anniversary coins: 500 lei from 2004, dedicated to the 140th anniversary of the Bucharest University, 500 lei gold 2009, dedicated to the 150th anniversary of the Union between Moldavia and Walachia in 1859, 10 lei 2009 coin dedicated to the 150th anniversary of the Statistical Office and on the coin set of 1 leu, 5 lei and 100 lei 2009, dedicated to the 150th anniversary of the establishment of the General Staff of the Romanian Army.